^ Micallef, Ken (May 22, 2012). "Santigold: ORCHESTRATING "BAD" SOUNDS AND ROUGH EDGES ON "MASTER OF MY MAKE-BELIEVE"". E-Musician. Retrieved April 4, 2013. White, a.k.a. 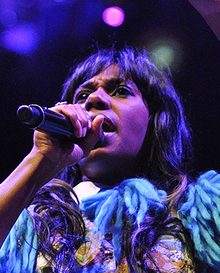 Santigold, is practically a one-woman Wrecking Crew. Whether playing the drums, guitar, keyboards, or all of the instruments; co-writing with Q-Tip, TV on The Radio’s Dave Sitek, and Yeah Yeah Yeahs’ Karen O; or meshing multiple producers’ ideas until she hits paydirt, Santigold is a potent powerhouse of songwriting skill. ^ "Santogold review". Pitchfork Media. Retrieved June 30, 2015. ^ Mark Pytlik (July 29, 2008). "Diplo / Santogold". Pitchfork. Pitchfork Media Inc. Retrieved March 15, 2013. ^ Priya Elan (September 5, 2008). "Santogold Vs Diplo". NME. IPC Media Entertainment Network. Retrieved March 15, 2013. ^ a b c Molly Brown (August 9, 2009). "Yeah Yeah Yeahs, Santigold Rev Lollapalooza Day 2". Billboard.com. Retrieved August 9, 2012. ^ a b Critcheloe, Cody (November 2011). "Black And Gold Santigold". V Magazine. Retrieved January 2, 2012. ^ "Santigold debuts new song 'Big Mouth' online". NME. January 18, 2012. Retrieved January 18, 2014. ^ a b "New Santigold: "Disparate Youth"". Pitchfork.com. February 20, 2012. Retrieved February 20, 2012. ^ Pelly, Jenn (February 21, 2012). "Santigold Album Gets Release Date". Pitchfork.com. Retrieved February 21, 2014. ^ "Master of My Make-Believe - Critics Reviews". Metacritic. Retrieved May 14, 2012. ^ Jason Siu (December 27, 2012). "2013 Honda Civic Commercial Released – Video". Autoguide.com. VerticalScope Inc. Retrieved March 15, 2013. ^ "Santigold playing Brooklyn show before Red Hot Chili Peppers tour (dates)". Brooklynvegan. January 2, 2012. Retrieved January 2, 2014. ^ Bychawski, Adam (January 14, 2013). "Santigold unveils 'Girls' video – watch". Retrieved December 18, 2015. ^ Brodsky, Rachel (June 30, 2015). "Santigold Drops Stomping New Single, 'Radio'". Spin. Retrieved December 18, 2015. ^ "Santigold "Can't Get Enough of Myself" Music Video". Retrieved February 26, 2016. ^ Peverelli, Benoit (January 6, 2012). "Amadou & Mariam Enlist Santigold, TV on the Radio, Nick Zinner for New Album". Pitchfork. Retrieved January 6, 2014. ^ Denham Sadler (January 4, 2013). "We chat with Bob Evans". Tone Deaf. Tone Deaf. Retrieved March 15, 2013. ^ triplejtv (March 6, 2013). "Like A Version: Bob Evans - Disparate Youth (Santigold cover)" (Video upload). YouTube. Google, Inc. Retrieved March 15, 2013.